William McGeorge was born on September 26, 1941, in Jamestown, New York. He was commissioned a 2d Lt in the U.S. Air Force through the Air Force ROTC program on January 31, 1965, and went on active duty beginning September 3, 1965. Lt McGeorge next completed Undergraduate Pilot Training and was awarded his pilot wings at Craig AFB, Alabama, in September 1966, followed by B-52 Stratofortress Combat Crew Training from October 1966 to January 1967. His first assignment was as a B-52 pilot with the 668th Bomb Squadron at Griffiss AFB, New York, from February 1967 to February 1968, and then to Helicopter Pilot Training from February to May 1968. After completing HH-3 Jolly Green Giant Combat Crew Training, Capt McGeorge served as an HH-3E helicopter pilot with the 58th Aerospace Rescue and Recovery Squadron at Wheelus AB, Libya, from September 1968 to June 1970. His next assignment was as an HH-53B/C pilot with the 40th Aerospace Rescue and Recovery Squadron at Udorn Royal Thai AFB, Thailand, from June 1970 to May 1971, and during this time he served as copilot of the HH-53 "Apple Five" during the Son Tay Raid, a clandestine mission to rescue American Prisoners of War in North Vietnam on November 21, 1970. 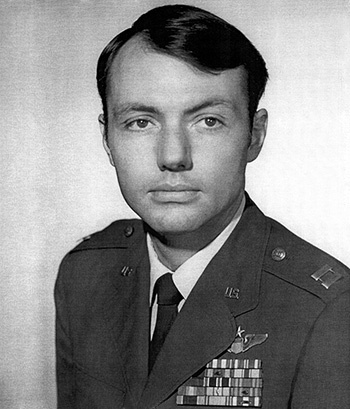 He then served as an H-53 instructor pilot with the 1551st Flying Training Squadron and the 1550th Aircrew Training and Test Wing at Hill AFB, Utah, from June 1971 to February 1973, followed by service as Aide to the Commander of the Ogden Air Material Area (later renamed Ogden Air Logistics Center) at Hill AFB from February 1973 to June 1974. 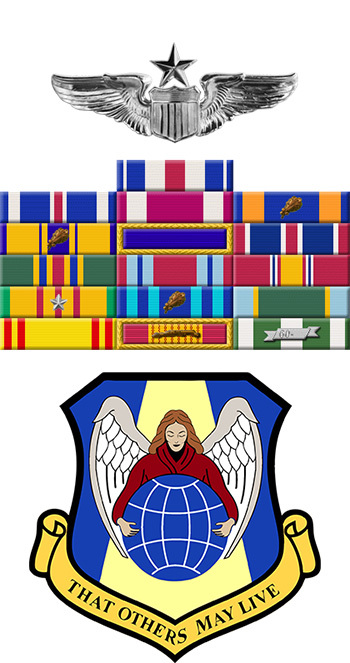 Maj McGeorge's final assignment was as Assistant Executive to the Vice Commander in Chief of U.S. Air Forces in Europe, Chief Flight Examiner of the 601st Tactical Control Wing, and Stan/Eval Staff Officer with Headquarters U.S. Air Forces in Europe at Ramstein AB, West Germany, from July 1974 until he was killed in the crash of a CH-53C at Sembach AB, West Germany, on March 17, 1976. Captain William M. McGeorge distinguished himself by gallantry in connection with military operations against an opposing armed force during the Prisoner of War Search and Rescue Operation at Son Tay, North Vietnam, on 21 November 1970. On that date, flying as Pilot of an aircraft prepared to carry out the rescue party and freed prisoners, Captain McGeorge flew deep into enemy territory in a bold night attempt to rescue American Prisoners of War. Completely aware of the enemy antiaircraft and surface-to-air missile threats enroute and in the objective area, Captain McGeorge totally disregarded his personal safety and skillfully and accurately performed his pilot duties, thereby enabling the crew to lead the force precisely to the target. As a result of Captain McGeorge's heroic efforts, the force arrived at Son Tay as planned, the enemy forces were completely surprised, and the mission was successfully completed. During the return flight, he successfully rescued a downed fighter pilot from hostile territory. By his gallantry and devotion to duty, Captain McGeorge has reflected great credit upon himself and the United States Air Force.